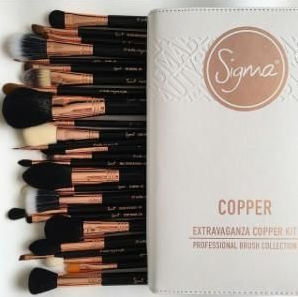 So I have had these Sigma Makeup brushes for about 5 years now (the same ones) & I feel like I can give a thorough review especially on their longevity. And let me tell you that they are almost like spanking new lol ! I bought two complete kits, one in Copper & one in Chrome. They used to have a Gold Complete Kit but then they did away with it for whatever reason. I remember how utterly disappointed I was when they did because I would have purchased that instead of the Copper. The main reason why I bought two was because I wanted to keep one set for my personal use & one set strictly for my clients. In the end it just got all mixed up so…blah. The packaging was so beautiful & it comes in these gorgeous binders which I still have…I don’t know what to do with them lol. I feel like they are just taking up space but they are so pretty…how could I possibly get rid of them? I wash my brushes with soap & water & I have found that over the years they are still good to me. 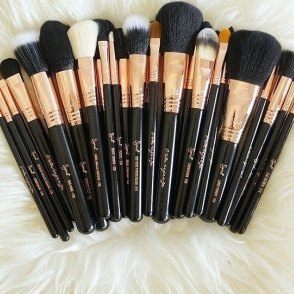 I hope you know how to wash your brushes correctly..always with the bristles facing down. Although this is an expensive investment…it is definitely worth having in your kit & it will last you for many years to come if treated with proper care. I can’t remember exactly how much I paid for mine almost 5 years ago but I don’t think it was this much. I wonder if they will be having a Black Friday Sale. I hope you are having a wonderful day or night wherever you are !